Important votive offerings were dedicated during the 6th century B.C., but the architectural form of both sanctuaries remained unpretentious until the beginning of the 5th century B.C., when the Athenians initiated the construction of an imposing poros temple in the temenos of Poseidon. The building was never completed, though, as both the temple and the offerings were destroyed by the Persians in 480 B.C. In the following decades, Sounion, like the rest of Attica, flourished, and an important building project was undertaken at both sanctuaries. 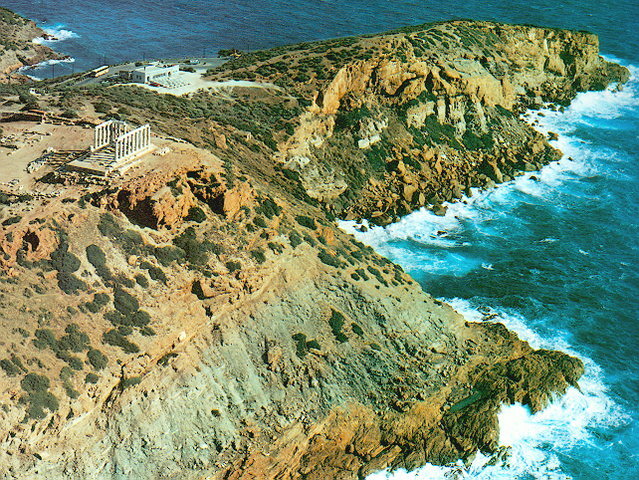 At the end of the 5th century and during the Peloponnesian War, the Athenians fortified Sounion cape. From the 1st century B.C. onwards, the sanctuaries gradually declined and Pausanias, who sailed along the coast of the promontory in the mid-2nd century A.D., wrongly considered the prominent temple on the top of the hill as the temple of Athena. The site of the temple was known in the following centuries, as is prooved by descriptions of modern travellers, who visited Sounion before the excavations started, as well as by graffiti on the stones, among which, that made by Lord Byron. Restricted excavations in the sanctuary of Poseidon were conducted in 1825 by the Dilettanti and by the German architect W. Doerpfeld. Systematic investigation was undertaken between 1897 and 1915 by the Athens Archaeological Society, under the direction of Val. Stais, with the collaboration of A. Orlandos. Since 1994, the Archaeological Society has been carrying out excavations at the Fortress.